A lot of video games are silly, when you really think about it, but that's part of what makes them a lot of fun. When people try to recreate what characters do in games, of course, the absurdity becomes clear. The rather cool Street Fighter series producer, Yoshinoro Ono, demonstrates this nicely in an enjoyable video in which he tries to recreate character moves from Ultra Street Fighter II: The Final Challengers. A good effort, we'd suggest. This video made me buy this game. Best Street Fighter 2 commercial yet. This make me laugh. This guy is great! That was fun... I think? find the link to this, you beat me to it! May this beautiful video never lose relevance. @Desrever City Hunter will never die! Talk about special moves. That had as much production effort as the game itself. 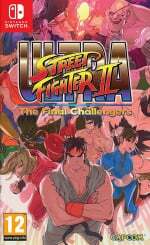 And I love USF2 and I appreciate a lot Yoshinoro Ono. I just came to say this. Making yourself look foolish to promote an overpriced game is still not going to make the average gamer buy the game. Some kid in the comments of the video remarked that this guy is one of the hardest working at Capcom. I beg to differ; look at the game. This is plain old silliness, but beautiful silliness all the same. I was grinning watching, but when it came up to Bison's Psycho I just burst out laughing. Ono's crazy, in a good way. Hahahahaha, ok Capcom I'll buy the game. @Anti-Matter that is so hilarious, I almost die of laugher when I first saw that. That video made my day. He's having so much fun it's hard not to smile.